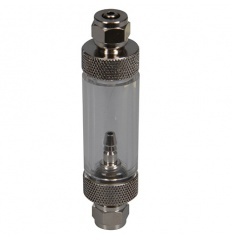 Enjoy simple and accurate control of your CO2 injection with the 2-in-1 Metal Bubble Counter and Check Valve by Ista. Constructed from metal, it offers fantastic durability and a long operational life. This Bubble Counter has been designed for use with air line tubing, and includes a stainless steel spring check valve, ensuring that backflow is prevented!